A while back, I wanted to try to make a typical Portuguese pastry called Pastel de Nata (one of these days I’ll make it again and post the recipe). It requires puff pastry, but when we went to the supermarket I couldn’t find it. 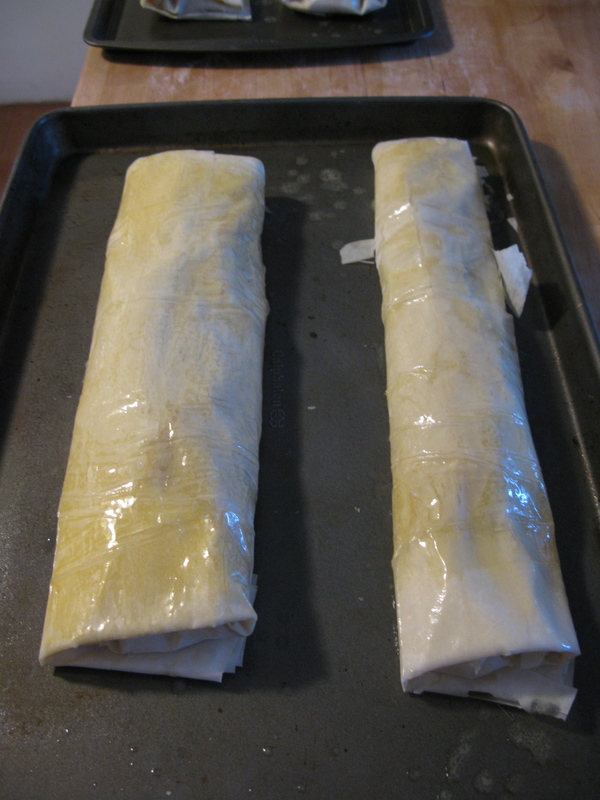 So we got Phyllo dough instead, hoping it would be the same. 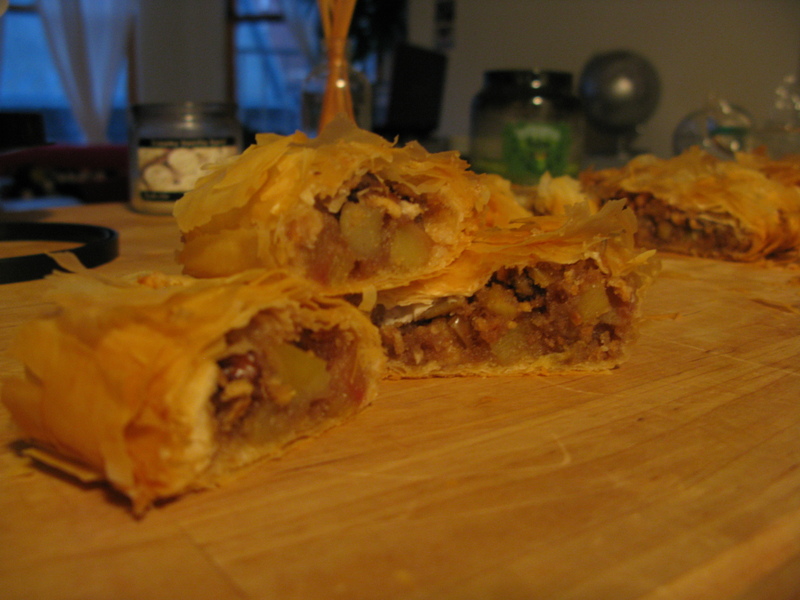 Turns out, they’re different (see here, for example), so I ended up with two packages of phyllo dough in the freezer. 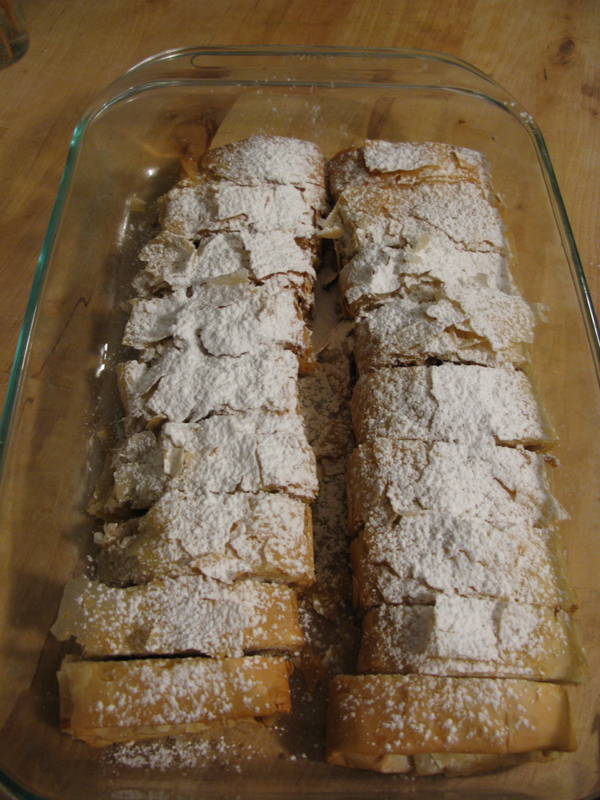 Well, last week we got a bunch of apples, and it’s Fall, and I wanted to do something with the phyllo dough… Apple strudel! I based my recipe on this one, but changed a couple of things. First, I chopped 5 apples. 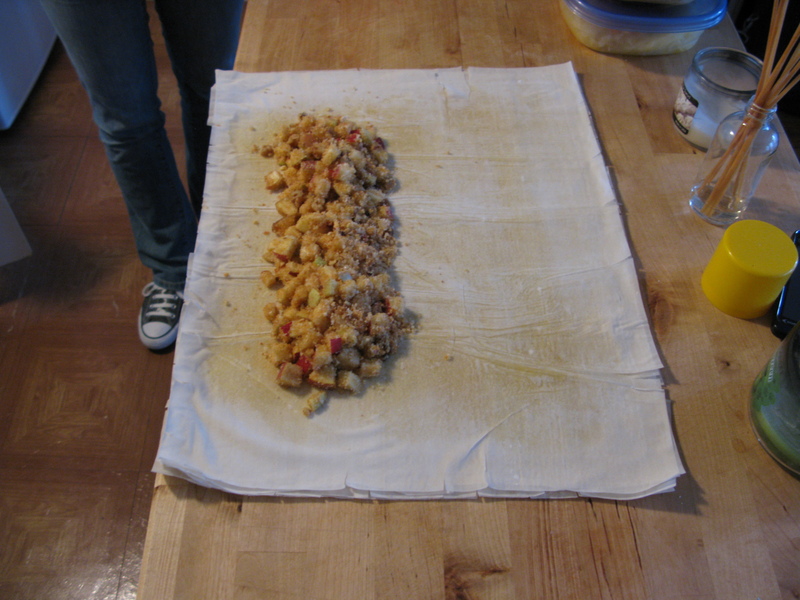 This is time consuming and tedious, but you want the apple bits to be small. Then I crumbled 4oz (120g) of bread in the food processor – I used toast slices I had bought to eat with cheese. I melted 1 tbsp of butter and toasted the bread for about 3 min. The apples were mixed with the bread, 1 cup (200g) of sugar, 1 tsp of cinnamon and 1/2 cup of chopped walnuts (I’m not a big fan of raisins and had those around). 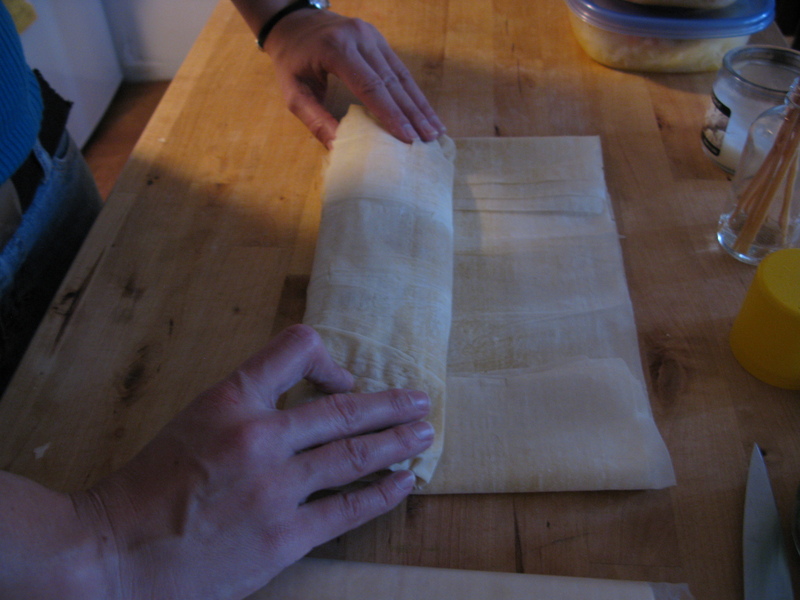 That makes the filling, then I had to deal with the phyllo dough. 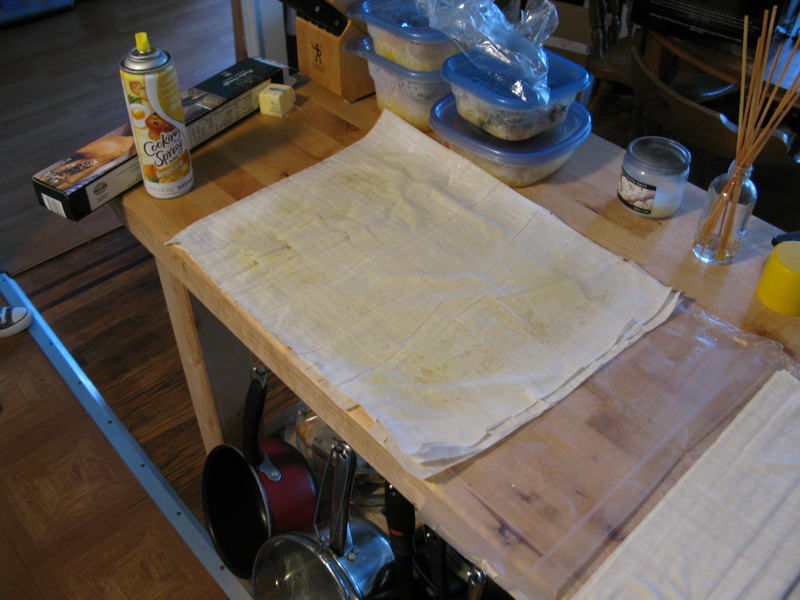 One by one, I separated the sheets, sprayed some cooking spray, and put another sheet on top. Each roll had 4-5 sheets. After they were stacked, and with some film over them, I pressed them together. 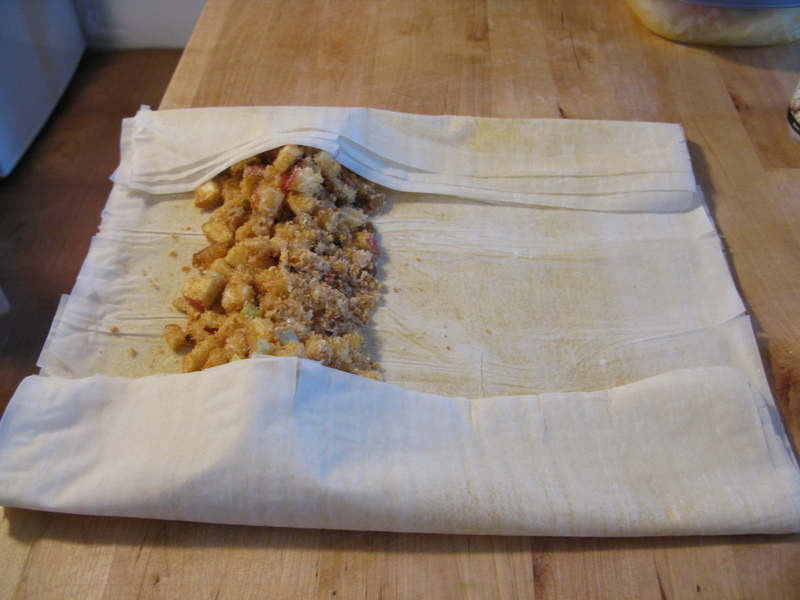 The film helps because your hands don’t end up sticking to the dough. Also, it’s ok if the dough cracks, there are several layers and the filling won’t escape. The smaller sides of the dough were folded in and then I rolled the rest. Finally, I melted 2 tbsp of butter in the microwave and brushed the top of the rolls. I ended up with four of these. These were then baked at 375ºF (190ºC) for 25 min. Just to make it prettier, I dusted some powdered sugar on top. This entry was posted in Baking, Dessert by Ines. Bookmark the permalink.